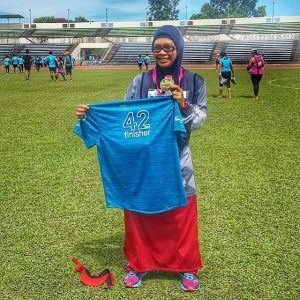 In 2014, Dr. Fauzia Adrini, better known as Andin, decided to join a marathon after seeing her friends posting their running results on Facebook. 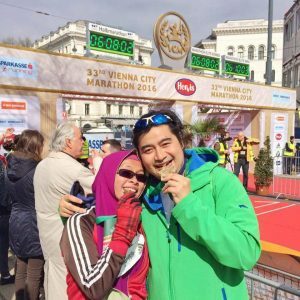 She started with brisk-walking, and now she runs marathon in various places. She was inspired to try out long distance running to challenge herself and also to improve healthcare. At the beginning it was tough and difficult for her because her body and mind needed time to get used to the precipitous training routine. Slowly she prepared herself to take on a full marathon. Nevertheless, she persevered. Now, at 44, she had undertaken a 44km marathon and has inspired many young doctors to participate in marathon. 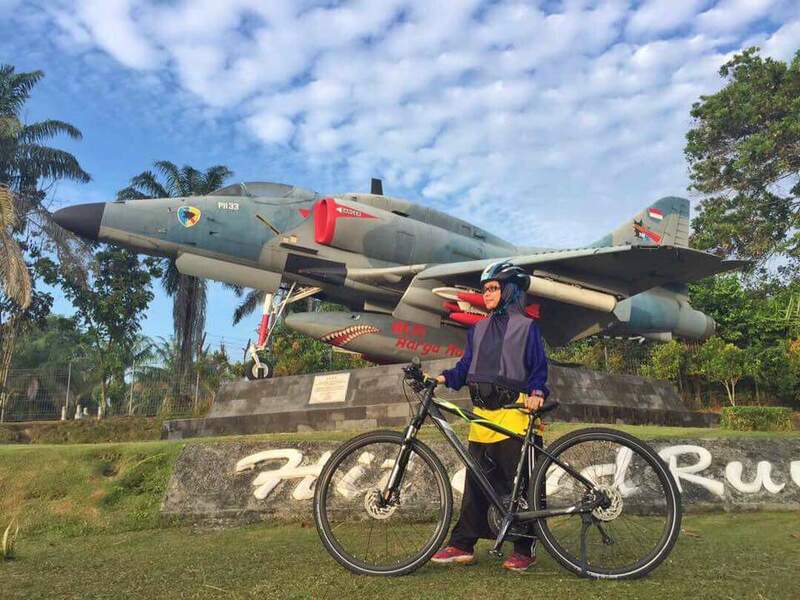 Apart from that Andin also grasped other sport skills from brisk walking to trail running, yoga, swimming, and triathlon. Andin is a doctor/lecturer and a mother raising a family with three beautiful children, one daughter and two sons. Living in Bandung, Indonesia, Andin, may sound like an ordinary person busy living her life. However, self-driven by her own voice and passion, the risk and challenges she had went through is what separate her from her ordinary self. This is a story that we all need to read to motivate ourselves to come out from our comfort zone. She taught us that one can simply become anything if we have the courage to pursue them. A few days ago, Nashata team had the privilege to interview the real-life hero. We received nothing but warmth and positive vibes from her sharing her story. N. When and how did you start running? A: In 2014, I saw many of my facebook’s friends posted their running result on their Facebook wall, and I thought it seems interesting to do that. Besides, when I was in high school, I love to do jungle-trekking and hiking with my friends. I want to continue to do sports as my routine activity like I used to and of course, I want to be healthy. So, I started with brisk-walking with my husband. It felt so hard in the beginning. Gradually combined walk-jog and finally, within 2 months I can run 30 minutes without stop. I felt so great! From that moment, I do running as my morning activity, with my husband and sometimes with my friends. And also, I started to join many running events after that. N: How often do you train? A: 4-5 days a week to do running workout, 2 times a week doing yoga, 1 day a week doing cycling and core training everyday. N: Wow. That sounds intense. Where do you usually train? A: On the road, at the jogging track. Sometimes go out of town to do trail running with friends. For cycling, I usually go cycling around the town with my husband and my friends. I join yoga class for women, swimming at public swimming pool and doing core workout at home. 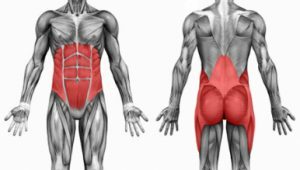 Side note: Core strengthening is the ability to use core muscles such as torso, hips, lower back, abs, shoulders in all three planes of motion with force. The core is primarily responsible for maintaining dynamic balance of the body centre gravity. N. What inspires you to run despite a tight schedule as a doctor? A: To be healthy. Also I want to inspire my students at medical school, my patients, and Moslem women to do healthy life style. N. Are you a part of a running group? If you are, what is the name of the group? A: Yes. We have a running group called KedoDoRun (Kedokteran Doyan Run means medical personels who love to do running). 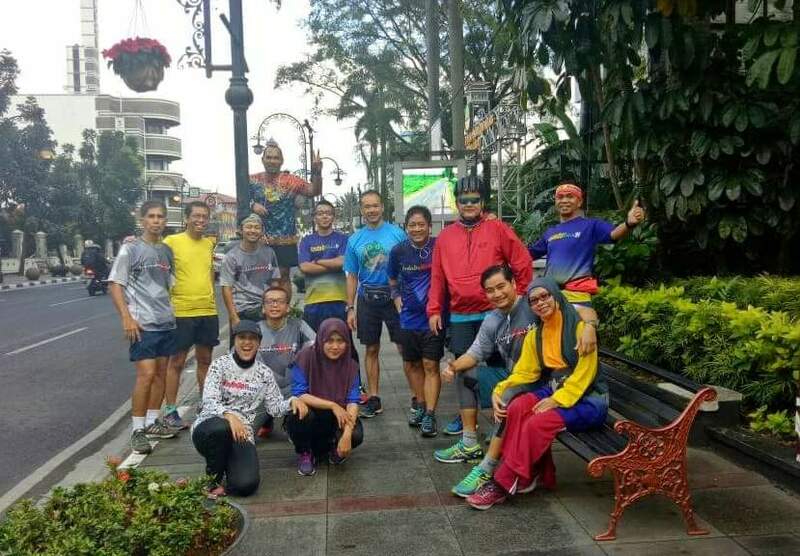 That’s the running group consist of doctors, dentists and medical / dentistry students in Indonesia. Besides running, we often share information or do sports meetings. N. Do you cross train or perform other sports? A : Swimming sometimes,but I do cycling more often. I do yoga two times a week. Yoga is very good for runners for strengthening and flexibility training because it’s useful to reduce injury and recovery after doing long run. I also perform core strengthening at home. N. When is your upcoming event? A: Standard Chartered Singapore Marathon on Dec, 3rd 2017. I will join Full Marathon (FM) Category. This is my second event on FM category. Hopefully I can reach my personal best on this event. On 2018, I will try triathlon event also because it will be interesting and my husband, also a triathlete, encourage me to do so. N. How is your diet like? A: I eat oatmeals with milk and fruits for my breakfast. I have lunch with usual meal but try not to have dinner after 6 pm. But, when I was in holiday, I often “cheat”. Hahaha I love to try local culinary so sometimes I give myself a chance to forget about my diet rule on holidays. N. Describe the training process for a marathon. How did you prepare–both mentally and physically? A: If you choose to join Full Marathon Category on an event, it means that you have to train 3-4 months before, 4-5 days a week. Not only running workout (interval, tempo, easy, and long run), also you have to do strengthening exercise (core workout) and flexibility (like yoga). So, you must make time to do all of them despite your daily activity as a mother, doctor and lecturer. Sometimes, I have to skip some of my training due to my tight schedule in my office. So, I have to communicate with my coach in order to modified the schedule on that week. N. What do you wear for your marathon run? A: Marathon run is an extreme sports. So I have to choose comfortable and also syar’i outfit to cover my aurah. I’ve tried some of hijab brands, and the most comfy one is Hooda hijab. Other outfit which I wear is sports shirt (actually our running group shirt) and modified skirt (pants which look like long skirt.) Hopefully Nashata will produce modified skirt too for Moslem women who choose to wear a long ‘skirt’ for their sport activity. And finally, of course I will wear visor and comfy running shoes. N. Insya Allah, soon, we will produce long running skirts. What is your favourite Nashata wear so far? A: My favourite product is Hooda Sports Hijab, I have some different colours of that hijab. And I will choose Sibaha and Azza Toplectic for my upcoming triathlon event on 2018. N: Where would you suggest runners to go for a run in Indonesia? Tell us the nicest spots you’ve ever been to. A: So many beautiful places in Indonesia. You have to try running at Belitung beach, doing trail run at Pulau Padar Labuan Bajo Flores. For runners who like to join the running event, I highly recommend May Bank Bali Marathon. N: Have you ever participated a marathon in a different country? What was it like? A: I have joined Penang Bridge International Marathon 2014, 2XU Singapore Marathon, Vienna City Marathon Austria 2016, Borneo International Marathon, Kota Kinabalu 2017. At Vienna, it was memorable because we were running along the beautiful Vienna city although it was soooo freezing. At Kinabalu, amazing city but felt so hard especially in between 30km – 38 km because I had to run at high inclination route. N. What do you find to be the most rewarding thing about running? A: I feel fresh and healthier everyday. In an event, the time that you reach the finishing line is such an amazing feeling. Suddenly you just forget every pain and exhaustion that you felt during the race. N. What is your advice to other novice runners? A: Do running gradually. Never do something “too much, too soon or too long”. It’s imposible that you can run 10km within 1 week if you have never run before. Running is a kind of extreme sport so you have to do it with preparation like (4-5 days a week, 30 minutes minimum), never skip the warm ups before workout and stretching down afterward. It is important so we can minimize injury risk. N. What do you wish for in the future? A: I hope more people would realize that being healthy by doing healthy life style is such a way to be grateful to Allah blessings. N: Thank you so much for agreeing to do the interview with us. We gained a lot of information from your wonderful experiences. We have to start somewhere and keep training. Never stop training and let’s keep improving for fitness reasons like Dr. Fauzia Andrini! 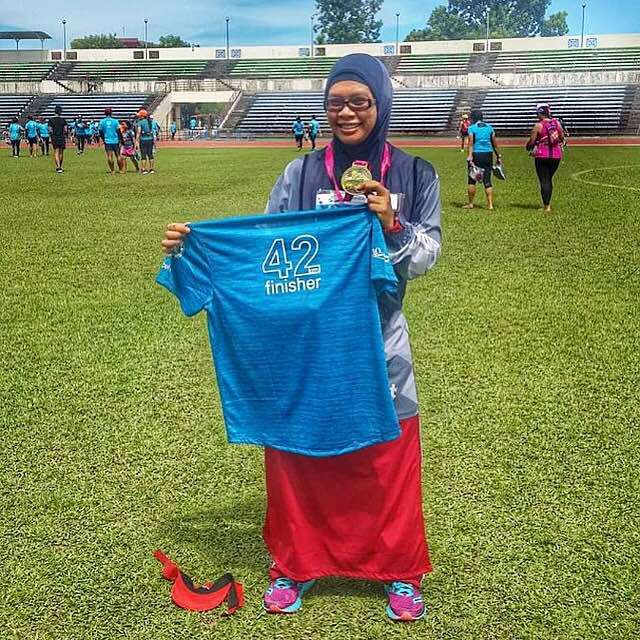 This entry was posted in Be Inspired, Fit Moms, General, Running, Running and tagged 2XU Singapore Marathon, Belitung beach, Borneo International Marathon, exercise, Fauzia Andrini, fitness, hooda sports hijab, indonesia, jilbab, jilbab instan, KedoDoRun, Kedokteran Doyan Run, Kota Kinabalu, malaysia, May Bank Bali Marathon, panutan larian, Panutan olahraga, penang bridge international marathon, Pulau Padar Labuan Bajo Flores, runners in Bandung, running doctor, sibaha swim wear, Standard Chartered Singapore Marathon, vienna city marathon austria, workout by aqilah. Bookmark the permalink.